Sitting out on the Northwest peak of Sunset Beach, Hawaii, World Cup competitor Brenda Scott knew she needed a high scoring wave to secure a final standing in the top three of the event. She scoured the horizon for the wave that would make it happen. All of a sudden a mountain of water came rushing in from deep ocean and funnelled onto the reef where Brenda had so strategically placed herself. Heavy seas and gnarly currents did not deter the 21 year old from seizing the moment and taking off on the biggest wave of the day. Spectators gasped as Brenda took a steep drop into the pit of what turned out to be the highest scoring wave of the final heat. Exhibiting finesse and control, Brenda rode the monstrous barrel to 1978 World Cup Victory and notoriety as International Surfing Professionals' prestigious "Rookie of the Year" award. Her ideology to "live each day to its fullest" brought her success in the early years of women's professional surfing. Today she surfs her winning drive into the world of business where her Hotline wetsuit company succeeds in delivering the best quality and service to its customers. Buy a Hotline wetsuit and you buy a guarantee of warmth, comfort and durability backed by Brenda Scott and all the employees at Hotline. So, how did Hotline get started? Well, it is the familiar story of boy meets girl, however, in this case the outcome was the formation of a partnership and the birth of a business! The story of Hotline began in the late 1970's on the cliffs above a popular Santa Cruz surf spot, Pleasure Point. Avid surfer and medical professional Doc Scott, (of Doc's Proplugs), was checking the surf and chanced upon two surfers visiting from Japan. The visitors inquired about local motels but, being the ambassador of goodwill that he is, Doc Scott invited them to come stay with his family at their house in Santa Cruz. Turns out the two visiting surfers, Hiroo Iida and Mesehito Kito, were involved in surf product distribution in Japan. Doc Scott's daughter Brenda was living at the house and, as a result of her father's chance meeting, a friendship evolved between her and Hiro Iida. Starting as a pen-pal relationship and growing into a deep friendship, the two found they shared a vision of developing an international trade business. The result was Hotline wetsuits which was founded in 1979. The first product marketed by Brenda in the United States was booties. Brenda utilized her surf contacts and natural instinct for business to market the booties, which soon became known to surfers as the best booties available. Increasing demand for the high quality booties and Brenda's successful marketing strategies resulted in Hotline importing wetsuits from Japan in the early 1980's. In 1988 Hotline started manufacturing their wetsuits in the United States. Since 1996 they have also been manufacturing their wetsuits overseas. The name Hotline was thought up by Michio Degawa when he was in the water thinking about wetsuits in terms of design and name. It was a cold day so he wanted wetsuits with nichrome wire. Nichrome wire in Japanese character is "heat line", then he thought of the name Hotline. The name has become a symbol of comfort and quality in the watersports world. As a successful competitor in the International Surfing Professionals (ISP) World Tour, Brenda Scott was in direct contact with the heart of the ever expanding surf industry. Brenda's competitive accomplishments and her powerful freesurfing on big waves made her a stand out in the crowds at Steamer Lane and Sunset Beach. 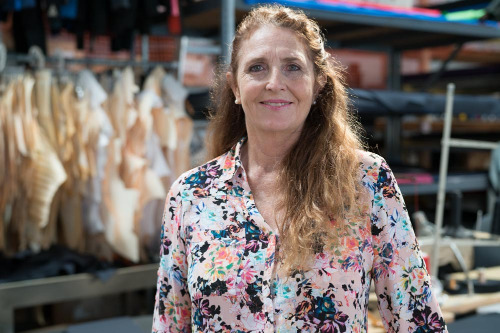 Her competitive strategy meshed well into the business world and Hotline became the best choice for wetsuit buyers. Experiencing steady growth in sales, Hotline has retained a firm grip on what they believe to be the heart of a successful endeavor: a sincere desire to provide the best product and service possible for the wetsuit market and the best possible working environment for their employees. Hotline now produces an all-encompassing line of state-of-the-art wetsuits and accessories. May we all enjoy the ocean's energy.